Let's start this again. Close your ears. And listen for the sweet sound of silence. The sweet serenity of silent sound. Yeahhh.... Now that's what I'm talking about. Which is really odd for me, as it would appear I was born without volume control and my “indoor voice” tends to be too loud for any venue aside from a hockey arena. But I digress. Imagine if you will, a performance so startling, so emotional yet rock-steady, and so jarringly graphic that no words uttered by the actor are required to draw you into their world. With so many options from the silent film era (era) to choose from, I opted towards more modern, stand-out performances, in an age where the norm settles around the trope of "more" being better than less. I recently watched The Seasoning House and, in her feature film debut, Rosie Day's performance of Angel, an orphaned deaf-mute enslaved during the Balkan war had me on edge for the entirety of the film. Right from the get-go, her every move, be it her posture or a reflection in her eyes displayed more than the spoken word ever could. Her role as care-(giver?) for a building of girls that are being held captive in a drug induced state for the purpose of prostitution to the Balkan military begins by breaking your heart and drawing you into her silent world of horrific pain. This gradually changes to cheering her on as the tides turn and her opportunity for revenge puts a smile on even her face. It is a hard watch, especially one scene in particular, but this is easily one of the best films I have seen in the past few months. I so look forward to all things Rosie Day to come. And that got me thinking about another “silent” performance that so moved me I did nothing but speak and think of it for days afterwards -- and still do, hence this mention. 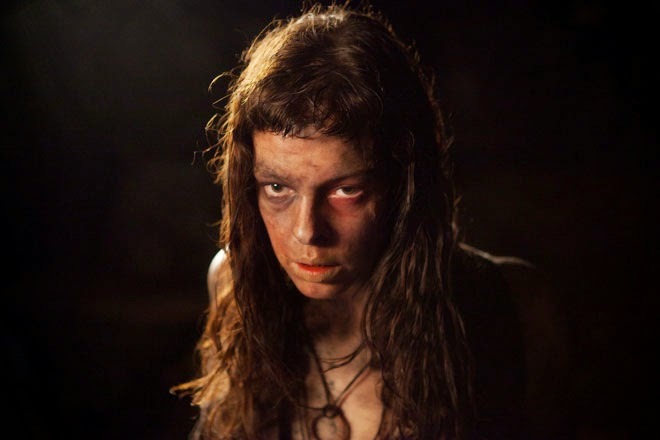 Pollyanna McIntosh in the titular role of Lucky McKee's The Woman is not for everyone, but holy hell was it ever for me. We watch her being captured and held captive by a family man who's primary goal at first appears to be that of “civilizing” her. Her silence shows the building rage as she endures assaults and being “de-humanized” and again conveys so much more than scripted words ever could. Her eyes. Her eyes draw us into her heart and we feel her anguish, humiliation and pain, showing us that the person lacking civility is not the one being held in chains. If you have not yet seen these two films, this month is clearly the perfect opportunity. I am trying to do all first viewings for the Scary Movie Challenge, but some are so worth a revisit. Yep, there's nothing better than a horror that throws the conventional scare tactics out the window and allows the characters to scare the crap out of us with merely a glimpse into their eyes. Speaking of which, I watched Nosferatu last night. Sweet merciful crap, Max Schreck, I'll be haunted by your eyes for some time to come now.